Police in Westbrook, Maine, want to get a message out to people who are making the trek to the city to bear witness to the mysterious and hypnotizing ice disk in the Presumpscot River: Look — enjoy its wonder, take pictures of it, stare at it in awe — but please, don’t try to explore it. The plea from police comes after a man Wednesday allegedly tied a rope to himself and connected it to a tree before attempting to venture out onto the arctic crop circle. According to the Portland Press Herald, police stopped the man before he could explore the icy formation, which has made national headlines this week and drawn interest from reporters from as far away as England and Japan. A video posted by the Press Herald shows the man walking on ice along the riverbank, poking at it with a stick, as he neared the edge of the frozen circle. The man never actually made it onto the ice disk, however. It’s the second time in the last few years that the Presumpscot River has had something strange lurking in its waters. “He came back to shore as police arrived. He was not arrested, and he was advised that it was not a smart idea, and he went on his way,” Goldberg said in a telephone interview. So far, Goldberg said the man’s attempt is the only one that’s been reported to police. But Goldberg wouldn’t “rule out that others have tried” to go on the river. “Never go on the ice in the Presumpscot River. It may be safe for the ducks, but it isn’t for humans. Please share this with everyone, and thanks for your attention to this matter,” police wrote. 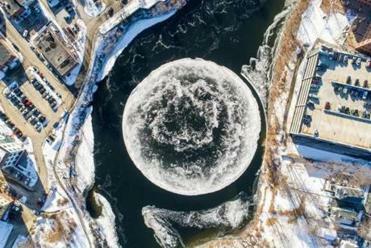 On Monday, officials from Westbrook, an old mill city west of Portland, posted several images, taken with a drone, of what they called the “ice disk,” a circular frozen sheet that was slowly spinning in the river and getting bigger. The “naturally occurring phenomenon” quickly became a local tourist attraction as well as a viral Internet sensation. By Wednesday, however, the disk’s slow pirouette came to a stop, after the approximately 100-yard arctic buzzsaw got snagged against the river’s edge. Even though it’s no longer moving, Goldberg said, people have continued to flock to Westbrook to gaze upon the rare occurrence.